A year-long randomized clinical trial (DIETFITS) has found that a low-fat diet and a low-carb diet produced similar weight loss and improvements in metabolic health markers. Furthermore, insulin production and tested genes had no impact on predicting weight loss success or failure. Thus, evidence to date indicates you should choose your diet based on personal preferences, health goals, and sustainability. This year-long study, creatively named The Diet Intervention Examining The Factors Interacting with Treatment Success (DIETFITS), involved 600+ participants. It was conducted by Dr. Christopher Gardner of Stanford University in conjunction with the US National Institutes of Health (NIH), the Nutrition Science Initiative (NuSI), and a team of nutrition experts. This is notable, since NuSI was co-founded by Gary Taubes, a prominent low-carb advocate and champion of the carbohydrate-insulin hypothesis of obesity. Previous studies comparing low-fat to low-carb diets have shown that individual weight loss can vary greatly within assigned diet groups. The reasons for these individual responses are not well understood, leading scientists to hypothesize that perhaps insulin sensitivity or certain genetic components might explain the success or failure of different diets. The present study tested whether differences in genetics or insulin production could help predict weight-loss success in participants undertaking either a low-fat or a low-carb diet for one year. This study is notable due to its large group of participants, long duration (12 months), and careful dietary monitoring. Furthermore, it was partially funded by NuSI, an organization co-founded by low-carb advocates. This RCT assigned 609 participants to either a low-fat diet or a low-carb diet for 12 months. In total, 263 males and 346 premenopausal females free of major health conditions (i.e., no diabetes, cancer, heart disease, high cholesterol, etc.) were included in the study. Average BMI was 33 (class I obesity), and average age was 40±7 years. Over the course of the study, each subject was instructed to attend 22 dietary counseling sessions with a registered dietitian; average attendance was 66% for both groups. During the first two months of the study, the low-fat group was instructed to consume only 20 g of fat per day and the low-carb group only 20 g of carbs per day. However, they were not expected to stay at these levels indefinitely: at the end of this 2-month period, they started adding fats or carbs back to their diet until they felt they’d reached the lowest intake level they could sustainably maintain. Neither group was able to stick to the very low starting intakes: by month 3, the low-fat group was already consuming an average of 42 g of fat per day, whereas the low-carb group was consuming an average of 96.6 g of carbs per day. It’s possible some in the low-carb group may have been in ketosis during these first two months due to the very low carb intake prescribed. While the low-carb group was able to achieve reduced carb intake throughout the trial (≈115 g/day), only a very small minority reported consuming ≤50 g/day — the intake threshold typically required to stay in ketosis. While no caloric intake targets were given, both groups were instructed to consume high-quality whole foods and drinks. Specifically, they were instructed to “maximize vegetable intake ... minimize intake of added sugars, refined flours, and trans fats; and ... focus on whole foods that were minimally processed, nutrient dense, and prepared at home whenever possible.” A total of 12 random and unannounced multi-pass 24-hour dietary recalls were taken over the course of the study to assess food intake. With this method, an interviewer asks individuals to recall all the foods and drinks they have consumed in the previous 24-hours. If you’re curious, you can try a multi-pass 24-hour recall on yourself here. Dietary compliance was also corroborated by changes in blood lipids and in respiratory exchange ratio (RER — this can indicate whether you are primarily “burning” fat or carbs). This trial randomly assigned 609 participants to either a healthy low-fat diet or a healthy low-carb diet for 12 months. Over those 12 months, everyone was instructed to attend 22 dietary counseling sessions with a dietitian. The dietitian showed them how to stick to a high-quality whole-food eating plan on their assigned diet. The first primary hypothesis being tested was a potential link between genotype pattern and diet type for weight-loss success. All participants were screened for 15 genotypes, including 5 “low-fat” genotypes (hypothesized to do better on a low-fat diet), 9 “low-carb” genotypes (hypothesized to do better on a low-carb diet), and 1 “neutral” genotype. The second primary hypothesis being tested was a potential link between insulin secretion and diet type for weight-loss success. At the start of the trial and at months 3, 6, and 12, all participants completed an oral glucose tolerance test (OGTT) to measure insulin production. An OGTT is a test that can measure your blood glucose and/or insulin levels after you’ve consumed a fixed amount of carbohydrate (normally 75 g of glucose). Other outcomes measured included changes in body composition (assessed by DXA scan), cholesterol levels, blood pressure, fasting glucose and insulin levels, resting energy expenditure, and total energy expenditure. Researchers looked to see if genotype or insulin production could predict weight loss on either a low-fat or a low-carb diet. Other health outcomes measured included weight change, body fat (DXA), cholesterol, blood pressure, and fasting glucose. In total, 481 participants completed the entire trial, which translates to a 21% dropout rate — not unexpected for a diet study of this duration. While there were no significant dietary differences between groups at baseline (before the dietary interventions started), there were significant differences at months 3, 6, and 12 with regard to the percent intake of carbohydrate, fat, protein, fiber, and added sugars (as seen in Figure 1). Additionally, saturated fat intake was significantly reduced in the low-fat group, whereas the overall glycemic index was lower in the low-carb group. While both groups saw reductions in glycemic load, the decline was much larger in the low-carb group. The study showed no significant weight-loss differences between the low-fat and low-carb groups. At 12 months, the low-fat group had lost 11.7 lbs (5.3 kg) and the low-carb group 13.2 lbs (6.0 kg); this difference of 1.5 lbs over 12 months (0.125 lbs/month) is neither statistically significant nor clinically relevant. Additionally, within each group, differences in genotypes or insulin secretion made no significant difference in weight change. This suggests that neither the genotype tested for in this study nor the amount of insulin produced during the OGTT can predict weight-loss success on either a low-fat or a low-carb diet. Ironically, a potential confounding factor masking an interaction could have been that both diets were based on whole foods. If, say, the low-fat diet had consisted mostly of sodas and refined grains, the resulting insulin resistance might have had an effect on weight change. Both groups were able to improve certain health markers (BMI, body fat percentage, waist circumference, blood pressure, and fasting insulin and glucose levels), although no significant differences were seen between groups. At the 12-month mark, low-density lipoprotein cholesterol (LDL-C) had significantly decreased in the low-fat group (-2.12 mg/dL), while it had increased in the low-carb group (+3.62 mg/dL). However, the low-carb group also saw a significant increase in high-density lipoprotein cholesterol (HDL-C) (+2.64, vs +0.40 mg/dL in the low-fat group) and greater reductions in triglycerides (-28.20, vs -9.95 mg/dL in the low-fat group). Resting energy expenditure (REE) was not significantly different between groups at any point. By month 12, REE had decreased significantly from baseline for both groups (-66.45 kcals for low-fat, -76.93 kcals for low-carb). Total energy expenditure (TEE) was not significantly different between groups or compared to baseline. Lastly, although a little over 10% of each group improved their metabolic syndrome during the trial, there was no significant difference between diets. No significant weight-loss differences were seen between the low-fat and low-carb groups, and neither genetics nor insulin production could predict weight-loss success on either diet. There were also no significant differences between groups for most other health markers tested. 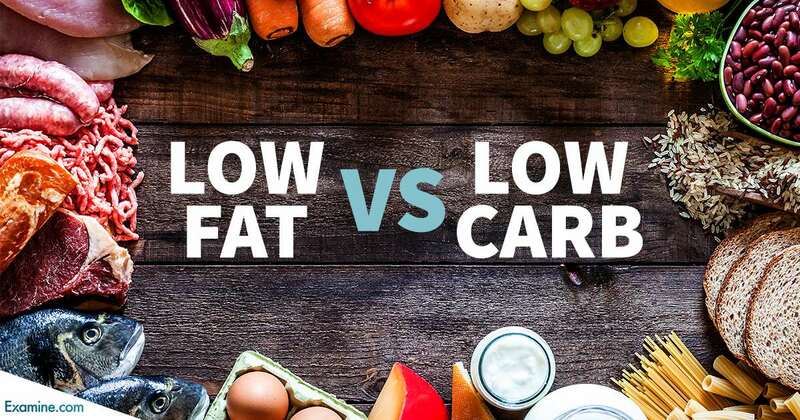 The results of this study contribute to a large body of evidence indicating that, for weight loss, neither low-fat nor low-carb is superior (as long as there’s no difference in caloric intake or protein intake). In this trial, overall caloric intake was nearly identical between groups throughout the intervention period, and the low-carb group consumed just a little more protein (an additional 12.5 g/day on average). The program offered intensive dietary counseling and guidance for the entire length of the study. Many free-living trials provide instruction and/or support up front, after which the participants are left to their own devices. It confirmed the participants’ dietary intakes through random multi-pass 24-hour dietary recalls, bolstered by lipid panels and RER tests. Most long-term diet trials simply use 24-hour recalls or food-frequency questionnaires. The study strongly encouraged its participants to consume healthy diets rich in whole foods and not to fill their pantries with low-fat or low-carb junk food. It is one of the larger studies of its kind, which reduces the odds of a result being due to random error (aka “noise”). While our understanding of the interactions between genetics and diet are still growing, this trial has tested 15 genotype patterns suspected of being able to influence weight-loss success or failure on low-fat or low-carb diets. Even though no effect was seen, the authors have stated that they will analyze “all the genomic data obtained ... to evaluate whether other genetic signatures” could be studied in the future. While the measure of insulin production used in this trial failed to predict weight changes, the authors note that, based on other studies, fasting insulin measures may be worth investigating further as weight-loss predictors. Lastly, not every participant adhered perfectly to the assigned diet, which reduces our ability to draw a direct relationship between genotype, insulin production, and diet intervention. However, the study results are still very suggestive of a relationship, and the authors plan to make further analyses that will take dietary adherence into account. The DIETFITS study replicates the results of numerous other RCTs, showing that, when caloric intake and protein intake are both matched between diet interventions, the proportion of carbs or fat matters little for weight loss. Furthermore, genotypes and insulin production were not predictive of weight loss (but other genotypes and insulin markers have yet to be rigorously tested). What should I take away from this? One important aspect of this trial we need to consider, and one that is often overlooked, is interindividual variability. As you can see in Figure 2, weight changes differed drastically within both groups — ranging from 70 lbs lost (-32 kg) to 24 lbs gained (+11 kg). Each bar represents the weight change of a single participant. Even when accounting for the ≈10% of participants who gained weight, the combined weight loss in this study was an impressive ≈6,600 lbs (3,000 kg). Overall, the graphs are quite similar (in terms of both distribution and weight loss/gain). Studies attempt to discern an overall effect, and often report nothing else — even when individual responses are all over the place. A second important aspect to consider is adherence. In the beginning of the study, all participants were instructed to consume either ≤20 g of fat (if in the low-fat group) or ≤20 g of carbs (if in the low-carb group) for the first two months, after which they could increase either their fat or carb intake to levels they felt they could sustain indefinitely. By the end of the trial, the vast majority had not been able to maintain such low levels. The final dietary recalls reported an average daily fat intake of ≈57 g (low-fat group) and an average daily carb intake of ≈132 g (low-carb group). Real-life applicability matters greatly when extrapolating from a study’s results. The results from this study send a clear message that, when choosing an eating style, sustainability is a component whose importance cannot be understated. There is no “best diet”. Both low-fat and low-carb diets can work for weight loss; the healthy diet that will work for you is the one you can stick to. Before the release of the study, we were able to ask the lead author some questions. The answers have been lightly edited for clarity. Q: The importance of diet quality was heavily emphasized in both study groups — something not traditionally given as much attention in other long-term diet trials. Were you able to gather any data on the participants’ healthy eating habits? You can partially get this data from Table 2 in the paper: we report decreases in added sugar and glycemic load for both groups and a decrease in glycemic index for the low-carb group. The low-fat group increased their fiber intake, and fiber intake was actually pretty good in the low-carb group too, even though it decreased from baseline. We have also analyzed the entire study group, using the Healthy Eating Index score (HEI 2010). An abstract has been submitted and accepted for the American Heart Association meeting in March, and the paper should be submitted for review before then. Unfortunately, the HEI doesn’t take into account some of the additional “quality” items we asked the participants to work on, such as cooking more at home (we did ask that question in another survey, and will incorporate that into a future paper). The diet assessment software does provide us with an overview of “whole grains” vs. “refined grains” and of “servings of vegetables and fruits” (including important subcategories of those). We were not able to capture data like organic, grass-fed, pasture-raised, wild-caught, even though we promoted those qualities to the participants who could afford them (we were very careful to not “shame” the participants who said they couldn’t). So the best answer is that we do have both formal and informal quantifications. We have a paper on this coming out, so I don’t want to give away the conclusion just yet! Q: You’ve collected a massive amount of data during this trial. What topics would you like to investigate next with this data set? We did create a very rich data set. Overall participants collectively lost >6,500 lbs, with some losing as much as 60 and others gaining as much as 20 on both diets. In addition to the wide range of weight loss, we documented a wide range of “adherence” to low-fat and low-carb, and these adherence data will likely add insights. We have also collected stool samples to analyze their microbiomes, and we have other genetic data to look at, as well as a set of psychological data that may give us other hints as to how to personalize diet recommendations. If and when we do find those hints, we’ll have to design a new study to test and replicate these discoveries. Q: What do you see as the next logical steps in the research lines pursued in the present study? The most common type of feedback we got from the most successful participants (in both diet groups) was that we had “changed their relationship to food”. In addition to teaching the participants (in 22 evening classes spread out over the year of the study) about low vs. high carb and fat intakes, we also worked with all participants on mindful vs. mindless eating (e.g., we asked them to not eat in the car or in front of a screen, to eat with friends and family, to try to cook for them and with them more often, and to shop more frequently for ingredients at a local farmers market). In a future study, I hope to build on these findings and think about ways to personalize “changing their relationship to food” by addressing the different sociocultural/psychological/emotional issues/barriers that were so prevalent at the beginning of the study for so many participants. And in that study we would have everyone focus on the main components of a foundational diet: more whole foods, more vegetables in particular, less added sugar, less refined grain. The people most successful in keeping their weight off “changed their relationship to food”. Q: While daily caloric intake limits were not set for any participant, the majority were able to lose weight. What strategies were used to achieve this? We worked on personalizing satiety. The AHA/ACC/TOS guidelines for the management of overweightness and obesity in adults discuss two options for reducing energy intake (section 3.3.1): a “prescribed” caloric restriction, or an “achieved” caloric restriction. We did not “prescribe” a specific caloric restriction. We focused on reducing foods high in fats or foods high in carbs, and we advised the participants that they needed to find the lowest level of fat or carb intake they could achieve while not feeling hungry. We explained that if what they were doing left them feeling hungry, then when they achieved their weight-loss goal or the study ended, they would likely go off their diet and back to what they were eating before, and so the weight would likely come back on. We wanted for them to find a new eating pattern they could maintain maintain without even thinking of it as a “diet”. We got a lot of positive feedback from the participants: they were happy to not have to “count calories” (to not have to limit their daily caloric intake). Table 2 in the paper shows that the participants reported “achieving” a ≈500 calorie deficit, without us prescribing one … and it was fairly consistent through the 12 months. Now, I honestly think they likely exaggerated the caloric restriction. But in fact they did lose >6,500 lbs collectively by the end of the study (≈3,000 kg), even though the level of physical activity only went up a little in both groups (the level of activity they reached was not statistically different from baseline). So they must have eaten less. I think this is an important area to explore. Those are four points agreed on by champions of every type of diet I can think of — vegan, paleo, low-fat, low-carb, Mediterranean, etc. Then there can be some Personalized Satiety items that might be more along the lines of steel cut oats and lentils for some people, more along the lines of avocado and nuts for others, and more along the lines of tuna and eggs for others still. Before worrying about the details, one should ensure their diet is more whole foods (with ample vegetables) than processed foods. If your chosen diet leaves you feeling hungry, you will likely revert back to old eating habits. When it comes to weight loss, neither a low-fat diet nor a low-carb diet is inherently superior. Neither insulin production nor the tested genotypes had any notable effect on weight-loss success or failure. Choose an eating style that fits your food preferences, health goals, lifestyle. Most importantly, choose an eating style you can sustain. Are there health benefits to a low carb diet? Can hypothyroidism lead to fat gain? How do I stay out of "starvation mode?" Is my “slow metabolism” stalling my weight loss? Does eating at night make it more likely to gain weight? Does diet soda inhibit fat loss? How do I get a six-pack? Is it really that bad to skip breakfast? How does protein affect weight loss? What should you eat for weight loss? Will lifting weights convert my fat into muscle? How do I lose fat around my belly? Does high-protein intake help when dieting? Whey vs soy protein: which is better when losing weight? I have lost significant weight and now have loose skin. How can I tighten up my skin? How do I increase insulin sensitivity? This page features 12 references. All factual claims are followed by specifically-applicable references. Click here to see the full set of references for this page.